You know him; you love him as the virtuosic, engaging leader of Stay Human, the house band that rocks The Late Show with Stephen Colbert five nights a week. 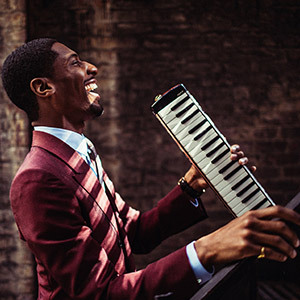 Now Jon Batiste – New Orleans-bred, Juilliard-trained, New York-based musician, educator, humanitarian and citizen of the world – makes his Musco Center debut: singing and playing keyboards and his signature harmonaboard in an intimate, anything-goes performance that fully invites the audience to participate in the fun. Chapman Students: All complimentary tickets for this event have been claimed. Please choose another event to claim your seats. A no-charge parking pass is included for all Musco Center performances when you choose the print-at-home ticket option – it will be included in the e-ticket attachment emailed to you.